Who doesn’t love panettone? At my table, it is a family tradition! In Brazil, Christmas dishes can vary from one region to the next, or even from family to family, yet panettone seems to be a near-unanimous national preference. Old-fashioned French toast (or rabanada in Portuguese) is another tradition handed down by my late maternal Grandmother, a Portuguese descendant. By uniting two family traditions, I came up with my own, with this scrumptious Upside-Down Panettone French Toast (Rabanada de Panetone) — a festive treat that can be served either for Christmas breakfast or as a dessert. Way cool, don’t you think? ‘Wait a minute! Isn’t panettone Italian?’ someone might ask… So ‘why is panettone a tradition in Brazil?’ Good question! This dome-shaped sweet bread loaf from Milan, Italy is a tradition in Brazil because my native country is home to the largest number of Italians outside of Italy. 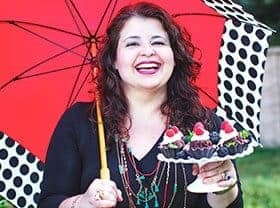 🙂 They have brought their traditions along with them, and influenced both Brazil’s cuisine and its culture — especially in the Southern and Southeastern regions. 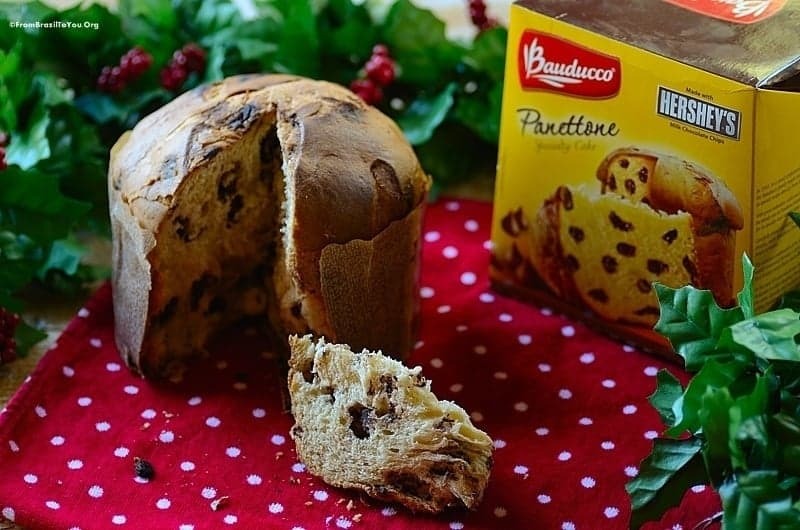 Although panettone is marketed under several brand names around the world, Bauducco is the most popular one in Brazil. In recent years, Brazilian-made panettone has been available in the US at Walmart supermarkets, among other places. Panettone is also enjoyed in many other countries in South America, Portugal, Southeastern France, Spain, Germany, and Switzerland. Its popularity is due to its delicious taste, low cost, and abundance. 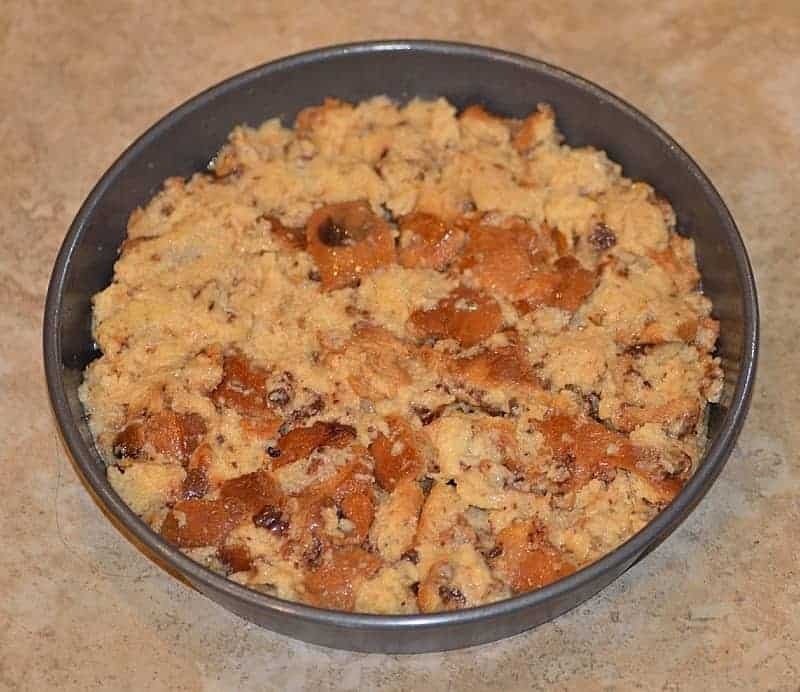 The most traditional type contains candied fruits and raisins– but nowadays, many variations are available, such as this one with chocolate chips. Some of the other panettone flavors found in different parts of the world include tiramisu, lemon, pear, fig, and herbs. …as well as receiving mention in a contemporary cookbook of that time, Opera dell’arte del cucinare, penned by Bartolomeo Scappi — personal chef to popes and cardinals. But only later, in the 18th century, did panettone come to be associated with Christmas. It was referred to in the writings of the Milanese illuminist Pietro Verri, who recorded its name as “Pane di Tono” (luxury cake). In the early 20th century, panettone began to be produced in large quantities in Italy, where it acquired its present tall, domed shape and light texture. Its popularity soon spread to other countries, where it began to take on different flavors. Nearly all who take a bite become instant fans. Personally, I can enjoy panettone plain, toasted and spread with butter or jam, in sweet sandwiches, tiramisu, trifles, bread puddings, panettone french toasts, and in many other culinary creations. P.S. : I am curious… What is your favorite panettone (brand and flavor)? 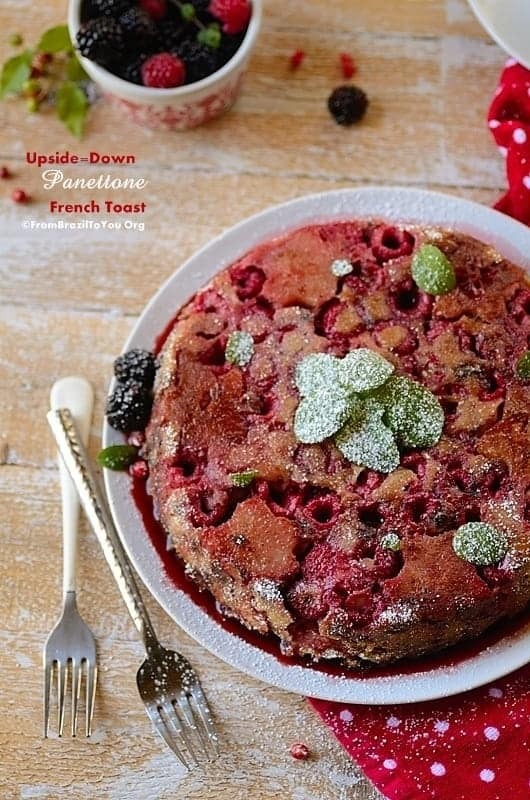 A festive, gorgeous french toast made from panettone, pears, and raspberries, that can be served for Christmas breakfast or as a dessert. Peel and slice pears crosswise into rounds about 1/2-inch thick. Remove seeds carefully with a sharp paring knife. Using a medium to small star shape cookie cutter, cut into stars. Place the star-shaped pears in a large bowl, and toss all sides gently with a mixture of lemon juice (to prevent discoloration), cinnamon, and nutmeg. In a large non-stick skillet, melt the butter over medium-high heat. Add the star-shaped pears and sauté for about 30 seconds. 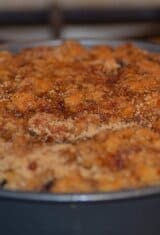 Add 2 tablespoons of the brown sugar and cook, agitating the skillet, until the sugar has dissolved (about 30-60 seconds). Remove from heat. Lightly grease a dark 9- inch round baking pan with butter (or butter flavored non-stick cooking spray). 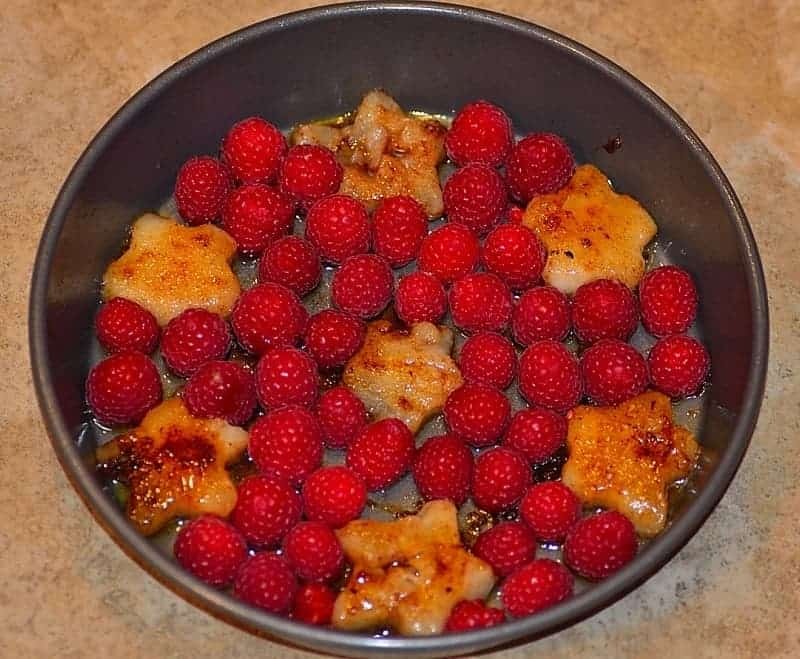 Arrange the star-shaped sautéed pears into the buttered pan. 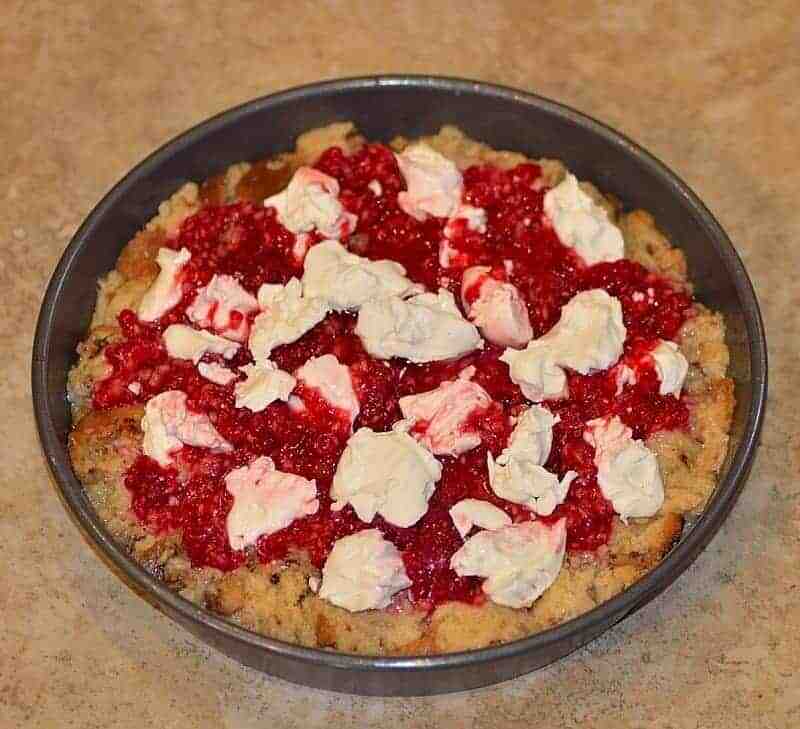 Then, arrange raspberries (about 1 to 1-1/2 cups) in the empty spaces and sprinkle raspberries with a pinch of powdered sugar. In a large bowl, beat the eggs, then whisk in milk, white sugar, and vanilla. Dip, tossing gently, panettone cubes into the egg-milk-sugar mixture just to moisten. 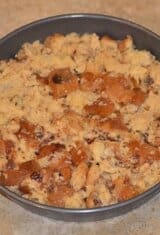 Using a slotted spoon, transfer half of the panettone cubes to the pan, arranging into a single layer over the layered fruits until no empty spaces are seen. 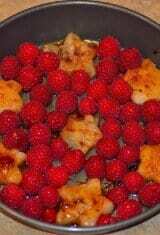 In a small bowl, mash with a fork 1 cup of raspberries with 1 tablespoon of powdered sugar. 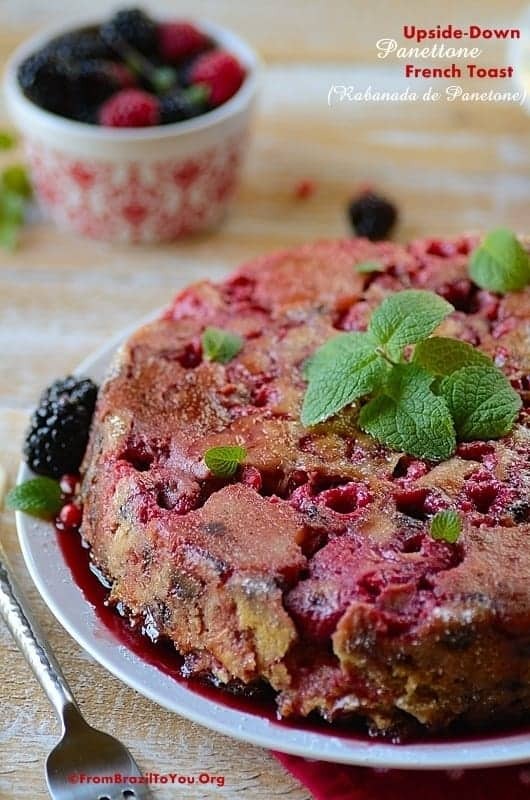 Then, pour and spread this berry mixture over the layered panettone cubes. 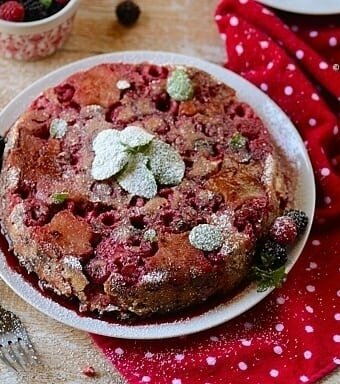 Using a teaspoon, spoon mascarpone cheese over the mashed raspberries (or place cream cheese cubes over the panettone cubes) . Next, layer the remaining panettone cubes on top and pour any leftover egg-milk-sugar mixture over the layered panettone cubes, making sure that there is no empty space left. (At this point, the panettone French toast can be covered and refrigerated overnight if desired). Sprinkle 2 tablespoon of brown sugar on top and bake the panettone French toast, uncovered, for about 35-40 minutes or until the top is golden. Allow to cool for 5 minutes on a rack. Run a knife around the edges gently. Place a serving tray/plate over the top of the pan, and carefully flip it over to unmold the panettone French toast onto the plate. If desired, sift a bit of powdered sugar on top of the panettone French toast to give a snow effect and garnish with fresh mint leaves. Extra fresh berries can be served on the side. 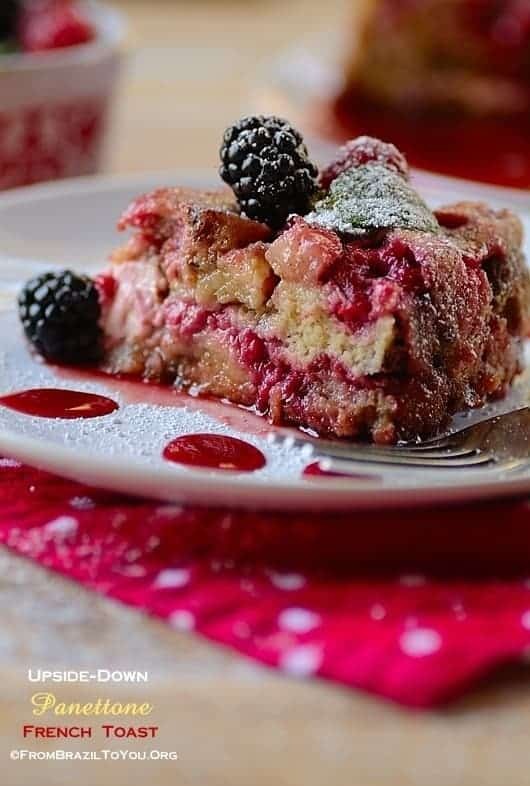 Serve panettone french toast warm for breakfast, or chilled as a dessert (In this last case, drizzle berry coulis or Port wine sauce on top). Raspberries are cultivated in both Southern and Southeastern Brazil. I can never say no to any French toast. Love them. Very festive and flavorful Rabanada de Panetone. Thank you for the detailed history. This really is way cool! What an interesting idea. Great twist on French toast. I’ll bet this tastes wonderful! Thanks for this. I have never ever imagined a version of French toast could look so beautiful. I am a BIG fan of Panettone too and adding it to this dessert just makes me love it more. Gorgeous beyond words! Perfect! We don’t have fresh raspberries here in Greece, so we’ll have to improvise something to substitute (any ideas? :) ), but it sounds really delicious! Thanks a lot! You can use strawberries or any other berry instead of raspberries. Sounds great! We ‘ll use some strawberries&blackberries together:) Thank you! I had no clue that Brazil was home to the most Italians outside of Italy! Your panettone/french toast sounds fabulous – love the pear in it! Thanks, Shashi! Italian immigrants have influenced both our cuisine and culture a lot. 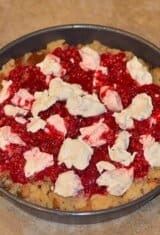 Panettone and raspberries? How could you go wrong? This looks perfect for holiday (and everyday) entertaining! Pinned! Thanks for sharing it, Chris! Pannetone is not something I’ve ever eaten. You are now making me wonder what I am missing. I’ve seen many recipes but I am not a fan of candied citrus and if I recall that is in there. Perhaps there are other varieties? 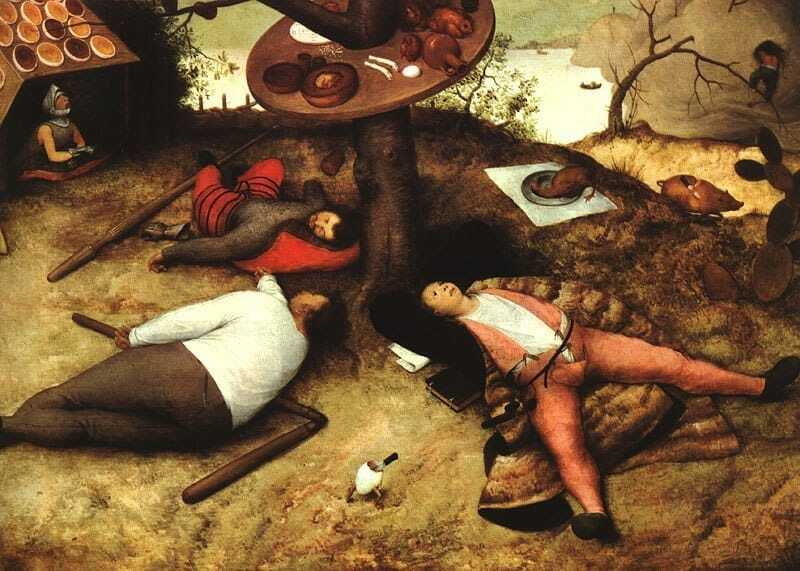 Love the art history! Abbe: There are different flavors of panettone. This French toast was made with the chocolate chip one. This looks so delicious and really beautiful! What a great idea and very festive! Denise, this is a brilliant idea! And you reminded me that I haven’t bought (never made from scratch…) Panettone this year! How could I forget! This year everything (including holiday cards) are delayed… actually I haven’t started anything Christmas besides setting Christmas tree! >_< I must catch up, and this french toast is really a great idea that I'd love to make!! I understand, Nami! Yes, the holidays are awesome but quite a busy time for everyone. I hope you find a time to shop and enjoy the season!!! This looks wonderful, Denise! What a great take on a traditional Christmas food in Brazil (as I just learned from your post :)). So, since you made it in a cake pan, does it make it a dessert then? Is Rabanada de Panetone usually a dessert, or is it more of a breakfast item? Hi, Julia! This is a versatile, mildly sweet dish that can be serve either as a dessert or for breakfast. How interesting, never knew the fact. I remember making panettone long long ago and now I just buy it, the quality is so good outside. Love french toast of any kind, I know this would be awesome. Girl, Christmas is almost here, I must say I’m a bit stressed. Just like Nami, haven’t done much as yet, then again, I just do it for fun, so I will sorta take it easy. hugs m’girl. This sure does look yum. This would certainly make a beautiful Christmas brunch item. It is so nice that it can be prepped the evening before. Thanks, Karen! This is certainly good for breakfast/brunch and as a dessert as well. Thanks for stopping by! OMG, Denise,This Panettone cake looks divine. The pictures, colors and the creativity in your post is outstanding. Thank you, Daniela, for your sweet words! Hi Denise,just came to say thank you so much for stopping by my blog and look what I see here awesome looking Christmas dessert !! …oh yumm!! is all I can say. Love the mix of fresh fruits and dry fruits in the dessert. Christmas traditions are such a precious combination of our individual histories! The Panettone French Toast is an extraordinary example, just irresistible Denise! Happy holidays! I love pannetonne, and I love using it for a French toast. This is an excellent way of making a one pan version! I love it! Pannetone? AND french toast? Altogether?? NUTS. I hopped over from Coffee and Crumpets when I saw that in the commentluv link underneath your comment, because there was no way I could not click on a title that had two of those things together. That looks stunning, I could murder one right now! Love the story behind panettone; I had no idea, just been eating it with no regard 😉 Thanks for sharing it and happy christmas to you! Thanks so much for the visit, Shu! As well as for the nice words. I am looking forward to stopping by on your blog. The pictures in the non-English version are much bigger and clear than the English version!!! That’s discrimination my friend hahahaha :). I loved loved they way it looks … OMG so juicy and tender. Sure gonna look for it at Walmart next visit and definitely will try your recipe. Thanks for sharing … I’ve missed all your great recipes. Thanks so much, Amira! It is so good to have you visiting me again here. I have missed your posts as well. See ya in a sec! 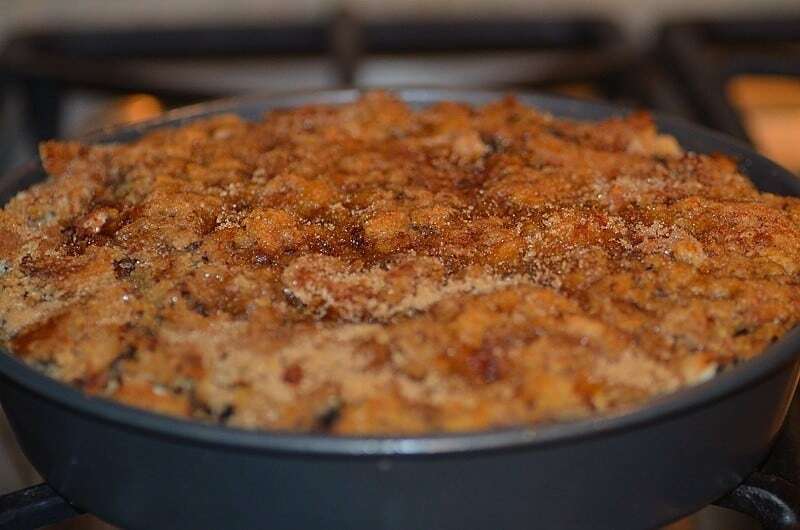 Denise hello, nice images and this recipe is delicious. I loved your site, congratulations.